I used cream with quark to the top and kiwis and persimmons as well. For Finland’s independence day this cake would be awesome with blueberries and blackberries. In summertime I would prefer strawberries and raspberries and mint leaves. Separate the egg whites from yolks. Watch out that you won’t mix egg yolk to whites. Put egg whites to a bowl and start whisking with a mixer. Add sugar one tablespoon at the time until you have half of the sugar left. Add potato flour to remaining sugar and mix. Now continue adding sugar/flour-mixture to the bowl. Meringue is ready when you lift the mixer out of the meringue and “dough” tips will keep their form upwards (see the picture). Add drops of lemon juice and mix again. Lift meringue to baking paper and make a round circle of it. Dry in an oven in 100 celsius for about 3 hours. Turn of the oven and leave the base to oven’s warm until oven has cooled down. 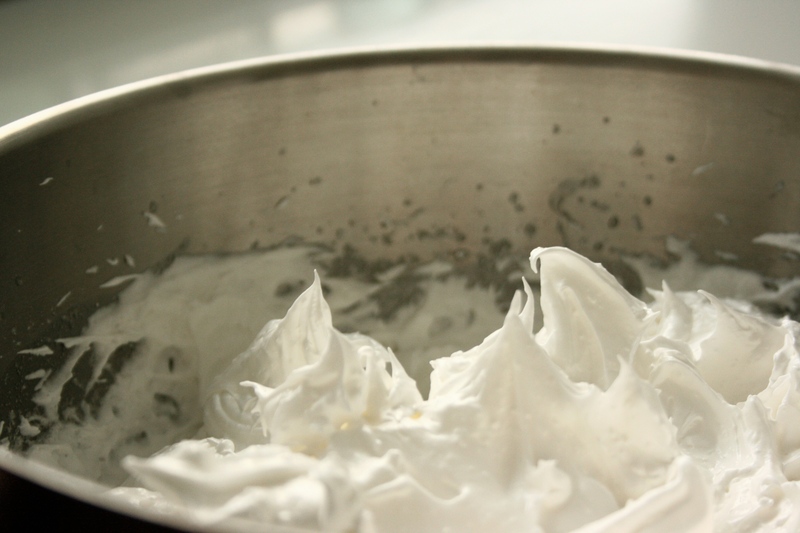 Whisk cream and when it is fluffy add quark and the sugars. Spread the cream on top of the base which has cooled down. Add peeled and cut fruits or berries to your taste. Enjoy immediately. Wow ❀‿❀ Pretty and yummy!